The other day one of our sweet boys pooped in the tub. Pooped. In the tub! Of course I knew that babies required diaper changes, but I didn't realize that diapers don't always do their job. We call this a diaper situation. It seems that diaper situations only happen when I'm alone with the the boys and the other boy desperately wants my attention. So I have to leave the crying boy to clean up the other boy. The first time this happened I had to think fast. The dirty clothes absolutely could not sit in the hamper, but I didn't want to take the time to put them in the wash when one of the boys was crying. So, I threw the dirty clothes out the kitchen door onto the lawn until I could get to it. Hey, it worked! Also, did you know that brand new baby boys like to pee when you take their diaper off to change it? And they have impressive range. They pee on the floor, on the wall, on themselves, and all over you. At least we can be thankful that neither of our guys were upset when they peed on themselves. Babies also spit up. One of our guys spit up a lot. I quickly learned to stop changing their clothes (and mine) when this happened. Just wipe a bit and they'll be fine. They've mainly outgrown the spit up phase, but now they are teething so they drool constantly. Drool. Like hound dogs. 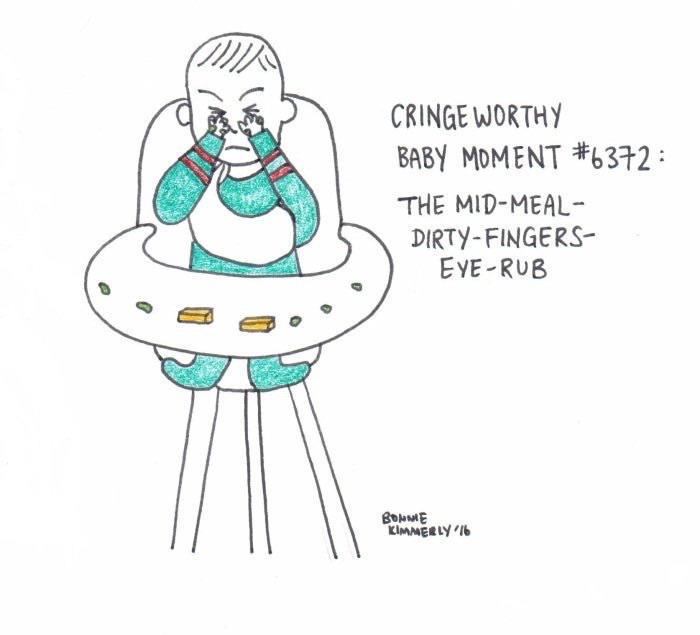 Introducing solid foods added a new opportunity for grossness. Our boys like to put their fingers in their mouth while the eat. Then they touch their face or their brother. Julian currently enjoys rubbing food through his hair as if it's a styling product. They also like to blow raspberries while they are eating. This has the benefit of getting food all over you and them at the same time. In the last 9+ months I've learned a lot about babies. I've learned that they're gross.